See the Category: 110 film. 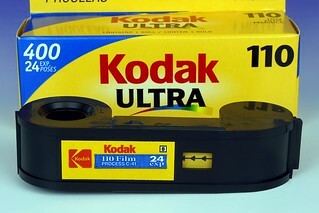 110 is a cartridge film format introduced by Kodak in 1972. The 110 frame size is 13 x 17 mm (0.51 x 0.67 in). There is one registration hole per frame. The film is paper-backed, with frame and film type information visible through a window in the plastic cartridge. 110 film includes pre-exposed frame lines and frame numbers. 110 and 126 film cassettes were launched by Kodak in answer to consumer complaints about the complications involved with loading and unloading roll film cameras. With the cassette film you don't have to attach the film leader to a take-up spool and cannot go wrong. The cartridge simply drops into the camera, you close the camera's back door, wind on and shoot. Even if you open the camera with a half exposed film inside, the precious exposed film is well protected inside the cassette. And at the end of the film, you don't have to rewind. After the success of Kodak's 126 cassette "Instamatic" cameras, 110 was introduced in 1972 to take advantage of improvements in film allowing smaller format negatives. The first Kodak cameras being branded "Pocket Instamatic". 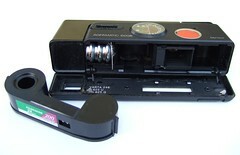 The 110 cassette contains 16mm wide film, with one perforation at each frame which engaged with a pin beside the film gate to control the film advance. Like 126, 110 film is pre-exposed with a border and frame number between the frames. The film is paper-backed; the paper being printed with frame numbers, visible through a small window in the cartridge's rear; a larger window in the film chamber door shows this frame number window plus a label on back of the cartridge giving film details. 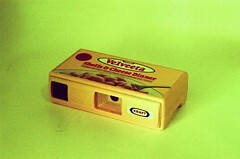 The small dimensions allowed designers to create small pocketable camera that had an aspect very different from the traditional 35mm cameras, even if they had a marked resemblance with the older sub miniature 16mm cameras. The pocketability and ease of loading made 110 popular very quickly. The design of the cassettes had a very basic system of notches in a tab on the end to indicate film speed, but few cameras took advantage of this, and many film cassettes did not even have the required notches. As the majority of 110 cameras were extremely simple - with a few notable exceptions such as the Rollei range and the Minolta and Pentax SLRs. Most 110 cameras had a single shutter speed and aperture setting and no focusing available, the success of getting prints from these tiny 13x17mm negatives relied on the latitude of the film. Even with today's modern film emulsions and an accurate focusing and exposure mechanism it would be tough to get much more than a 5×7in print from such a tiny negative. Disappointing print results were the main downfall of the format. 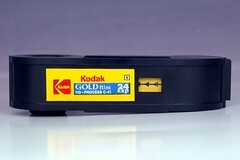 Kodak discontinued all 110 slide films in 1982. Kodak stopped making 110 cameras around 1994, with few other manufacturers' 110 ranges lasting any longer. 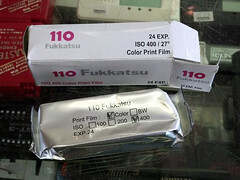 110 negative film continued to be made by Fuji until September of 2009, and by Kodak and Ferrania for a few years more. It later resumed production (see below). In 2010, Fotoimpex (under the Adox brand name) investigates the feasibility of producing 110 film. In 2011, their web page was updated that stated backing paper and film cassettes have been produced. In 2012, the factory is being retrofitted and plans are underway to reintroduce the format. In 2012, a resurgence of 110 film started when a small Hong Kong based company Films Reborn released small batches of Fukkatsu 110 film in 100 ISO black & white and 400 ISO colour for direct distribution in spring of 2012. During this time Lomography also released their Orca line of black & white film.. Lomography's initial batch of films did not contain the backing paper. A couple of months later they also introduce another film called Tiger which is a 200 ISO C-41 colour film. A few months later in Jan, 2013 a 200 ISO colour slide film called Peacock was announced. Lomography also sells a redscale 110 film. With Lomography now making it, 110 film has outlived two formats intended to replace it, disc film and APS film. This page was last edited on 5 April 2019, at 06:01.